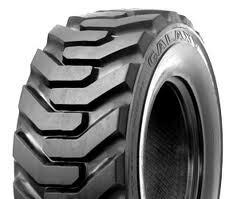 The "Beefy baby" tires are the standard bearer of the Galaxy family of skid steer tires. The "Beefy Baby" tires are the most durable and versatile skid steer R-4 bias ply type of tires in the galaxy. Our "Beefy Baby" tires have been proven to be the lowest cost per hour R-4 design tires in the market. Acknowledged the "feefiest and best R-4 design skid steer tires in the world - by users, dealers, renters, and OEMS. Galaxy's "Beefy Baby" is the standard by which all other skid steer tires are measured. The Beefy Baby II has a wear resistant (harder) compound, which allows it to wear longer than any other R-4 design bias ply skid steer tire.